Description: This volume is part of a series of English translations of the Syriac Peshitta along with the Syriac text carried out by an international team of scholars. D. Walter and G. Greenberg have translated the text, while Kiraz has prepared the Syriac text in the west Syriac script, fully vocalized and pointed. The translation and the Syriac text are presented on facing pages so that both can be studied together. All readers are catered for: those wanting to read the text in English, those wanting to improve their grasp of Syriac by reading the original language along with a translation, and those wanting to focus on a fully vocalized Syriac text. Citation: Tawny L. Holm, review of Gillian Greenberg and Donald M. Walter, trans. 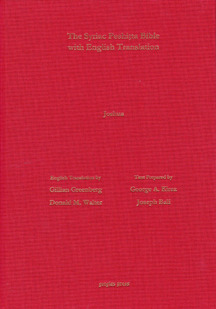 ; George A. Kiraz and Joseph Bali, eds., Joshua according to the Syriac Peshitta Version with English Translation, Review of Biblical Literature [http://www.bookreviews.org] (2019).